For other uses, see Quinoa (disambiguation). Quinoa (/ˈkiːnwɑː/ or /kɪˈnoʊ.ə/, from Quechua kinwa or kinuwa) is an annual seed-producing flowering plant (Chenopodium quinoa) grown as a grain crop. It is a pseudocereal, not a grass, unlike wheat and rice. It is botanically related to spinach. Quinoa seeds are rich in protein, dietary fiber, B vitamins, and dietary minerals in amounts greater than in many grains. It is gluten-free. Quinoa is cultivated in the Andes Mountains of Bolivia, Argentina, and Peru where it originated; in Colorado; and in six European countries. After harvest, the seeds are processed to remove the bitter-tasting outer seed coat. Quinoa crop prices tripled between 2006 and 2013 as a result of increased consumption in North America, Europe, and Australasia. Quinoa originated in the Andean region of northwestern South America. It was first used to feed livestock 5.2-7 thousand years ago, and for human consumption 3-4 thousand years ago in the Lake Titicaca basin of Peru and Bolivia. Chenopodium quinoa is a dicotyledonous annual plant, usually about 1–2 m (3–7 ft) high. It has broad, generally powdery, hairy, lobed leaves, normally arranged alternately. The woody central stem is branched or unbranched depending on the variety and may be green, red or purple. The flowering panicles arise from the top of the plant or from leaf axils along the stem. Each panicle has a central axis from which a secondary axis emerges either with flowers (amaranthiform) or bearing a tertiary axis carrying the flowers (glomeruliform). The green hypogynous flowers have a simple perianth and are generally self-fertilizing. The fruits (seeds) are about 2 mm (1⁄16 in) in diameter and of various colors—from white to red or black, depending on the cultivar. Chenopodium quinoa is believed to have been domesticated in the Peruvian Andes from wild or weed populations of the same species. There are non-cultivated quinoa plants (Chenopodium quinoa var. melanospermum) that grow in the area it is cultivated; these may either be related to wild predecessors, or they could be descendants of cultivated plants. In their natural state, the seeds have a coating which contains bitter-tasting saponins, making them unpalatable. Most of the grain sold commercially has been processed to remove this coating. This bitterness has beneficial effects during cultivation, as it deters birds and therefore, the plant requires minimal protection. The genetic control of bitterness involves quantitative inheritance. Although lowering the saponin content through selective breeding to produce sweeter, more palatable varieties is complicated by ≈10% cross-pollination, it is a major goal of quinoa breeding programs, which may include genetic engineering. The toxicity category rating of the saponins in quinoa treats them as mild eye and respiratory irritants and as a low gastrointestinal irritant. In South America, the saponins have many uses, including their use as a detergent for clothing and washing, and as a folk medicine antiseptic for skin injuries. Additionally, high levels of oxalic acid are in the leaves and stems of all species of the genus Chenopodium, and in the related genera of the family Amaranthaceae. The risks associated with quinoa are minimal, provided those parts are properly prepared and the leaves are not eaten to excess. Raw, uncooked quinoa is 13% water, 64% carbohydrates, 14% protein, and 6% fat. Nutritional evaluations indicate that a 100 g (3.5 oz) serving of raw quinoa seeds is a rich source (20% or higher of the Daily Value, DV) of protein, dietary fiber, several B vitamins, including 46% DV for folate, and the dietary minerals magnesium, phosphorus, and manganese. After cooking, which is the typical preparation for eating the seeds, quinoa is 72% water, 21% carbohydrates, 4% protein, and 2% fat. In a 100 g (3.5 oz) serving, cooked quinoa provides 120 kcal (500 kJ) and is a rich source of manganese and phosphorus (30% and 22% DV, respectively), and a moderate source (10–19% DV) of dietary fiber, folate, and the dietary minerals, iron, zinc, and magnesium. Quinoa is gluten-free. 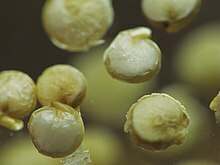 Because of the high concentration of protein, ease of use, versatility in preparation, and potential for increased yields in controlled environments, it has been selected as an experimental crop in NASA's Controlled Ecological Life Support System for long-duration human occupied space flights. The plant's growth is highly variable due to the number of different subspecies, varieties and landraces (domesticated plants or animals adapted to the environment in which they originated). However, it is generally undemanding and altitude-hardy; it is grown from coastal regions to over 4,000 m (13,000 ft) in the Andes near the equator, with most of the cultivars being grown between 2,500 m (8,200 ft) and 4,000 m (13,000 ft). Depending on the variety, optimal growing conditions are in cool climates with temperatures that vary between −4 °C (25 °F) during the night to near 35 °C (95 °F) during the day. Some cultivars can withstand lower temperatures without damage. Light frosts normally do not affect the plants at any stage of development, except during flowering. Midsummer frosts during flowering, a frequent occurrence in the Andes, lead to sterilization of the pollen. Rainfall requirements are highly variable between the different cultivars, ranging from 300 to 1,000 mm (12 to 39 in) during the growing season. Growth is optimal with well-distributed rainfall during early growth and no rain during seed maturation and harvesting. Quinoa has been cultivated in the United States, primarily in the high elevation San Luis Valley of Colorado where it was introduced in 1983. In this high-altitude desert valley, maximum summer temperatures rarely exceed 30 °C (86 °F) and night temperatures are about 7 °C (45 °F). Due to the short growing season, North American cultivation requires short-maturity varieties, typically of Bolivian origin. Several countries within Europe have successfully grown quinoa on a commercial scale. Quinoa plants do best in sandy, well-drained soils with a low nutrient content, moderate salinity, and a soil pH of 6 to 8.5. The seedbed must be well prepared and drained to avoid waterlogging. The genome of quinoa was sequenced in 2017 by researchers at King Abdullah University of Science and Technology in Saudi Arabia. Through traditional selective breeding and, potentially, genetic engineering, the plant is being modified to have higher crop yield, improved tolerance to heat and biotic stress, and greater sweetness through saponin inhibition. Traditionally, quinoa grain is harvested by hand, and only rarely by machine, because the extreme variability of the maturity period of most Quinoa cultivars complicates mechanization. Harvest needs to be precisely timed to avoid high seed losses from shattering, and different panicles on the same plant mature at different times. The crop yield in the Andean region (often around 3 t/ha up to 5 t/ha) is comparable to wheat yields. In the United States, varieties have been selected for uniformity of maturity and are mechanically harvested using conventional small grain combines. The plants are allowed to stand until the stalks and seeds have dried out and the grain has reached a moisture content below 10%. Handling involves threshing the seedheads from the chaff and winnowing the seed to remove the husk. Before storage, the seeds need to be dried in order to avoid germination. Dry seeds can be stored raw until being washed or mechanically processed to remove the pericarp to eliminate the bitter layer containing saponins. The seeds must be dried again before being stored and sold in stores. In 2016, world production of quinoa was 148,720 tonnes, led by Peru and Bolivia with 97% of the total combined (table). Since the early 21st century when quinoa became more commonly consumed in North America, Europe, and Australasia where it was not typically grown, the crop value increased. Between 2006 and 2013, quinoa crop prices tripled. In 2011, the average price was US $3,115 per tonne with some varieties selling as high as $8,000 per tonne. This compares with wheat prices of $9 per bushel (about US $340 per tonne), making wheat about 10% of the value of quinoa. The resulting effect on traditional production regions in Peru and Bolivia also influenced new commercial quinoa production elsewhere in the world, such as the United States. By 2017, quinoa was being cultivated in some 50 countries. Farmer field school on crop husbandry and quinoa production, near Puno, Peru. Rising quinoa prices over the period 2006 to 2017 may have reduced affordability of traditional consumers to consume quinoa. However, a 2016 study using Peru's Encuesta Nacional de Hogares found that during 2004-2013 rising quinoa prices led to net economic benefits for producers, and other commentary has suggested similar conclusions, including for women specifically. It has also been suggested that as quinoa producers rise above subsistence-level income, they switch their own consumption to Western processed foods which are often less healthy than a traditional, quinoa-based diet, whether because quinoa is held to be worth too much to keep for oneself and one's family, or because processed foods have higher status despite their poorer nutritional value. Efforts are being made in some areas to distribute quinoa more widely and ensure that farming and poorer populations have access to it and have an understanding of its nutritional importance, including use in free school breakfasts and government provisions distributed to pregnant and nursing women in need. In terms of wider social consequences, research on traditional producers in Bolivia has emphasised a complex picture. The degree to which individual producers benefit from the global quinoa boom depends on its mode of production, for example through producer associations and co-operatives such as the Asociación Nacional de Productores de Quinua (founded in the 1970s), contracting through vertically-integrated private firms, or wage labour. State regulation and enforcement is also important. It has promoted a shift to cash-cropping among some farmers and a shift toward subsistence production among others, while enabling many urban refugees to return to working the land, outcomes with complex and varied social effects. 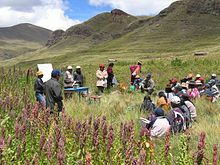 The growth of quinoa consumption in nonindigenous regions has raised concerns over food security, such as unsustainably intensive farming of the crop, expansion of farming into ecologically fragile ecosystems, threatening both the sustainability of producer agriculture and the biodiversity of quinoa. World demand for quinoa is sometimes presented in the media particularly as being caused by rising veganism, but academic commentary has noted that promoting meat consumption as an ethical alternative to eating quinoa is generally inconsistent with achieving a sustainable world food supply. The United Nations General Assembly declared 2013 as the "International Year of Quinoa"  in recognition of the ancestral practices of the Andean people, who have preserved it as a food for present and future generations, through knowledge and practices of living in harmony with nature. The objective was to draw the world’s attention to the role that quinoa could play in providing food security, nutrition and poverty eradication in support of achieving Millennium Development Goals. Some academic commentary emphasised, however, that quinoa production could have ecological and social drawbacks in its native regions, and that these problems needed to be tackled. Quinoa is used in the Jewish community as a substitute for the leavened grains that are forbidden during the Passover holiday. Several kosher certification organizations refuse to certify it as being kosher for Passover, citing reasons including its resemblance to prohibited grains or fear of cross-contamination of the product from nearby fields of prohibited grain or during packaging. However, in December 2013 the Orthodox Union, the world's largest kosher certification agency, announced it would begin certifying quinoa as kosher for Passover. Quinoa was first domesticated by Andean peoples around 3,000 to 4,000 years ago. It has been an important staple in the Andean cultures, where the plant is indigenous, but relatively obscure to the rest of the world. The Incas, who held the crop to be sacred, referred to it as chisoya mama or "mother of all grains", and it was the Inca emperor who would traditionally sow the first seeds of the season using "golden implements". Native Mapuches in south-central Chile cultivated quinoa but there is uncertainty as to whether this variety originated in Central Chile or in the Central Andes of Peru and Bolivia. During the Spanish conquest of South America, the colonists scorned it as "food for Indians", and suppressed its cultivation, due to its status within indigenous religious ceremonies. The conquistadors forbade quinoa cultivation at one point, and the Incas were forced to grow wheat instead. ^ "The Plant List: A Working List of All Plant Species". Retrieved May 1, 2014. ^ a b "Quinoa: An ancient crop to contribute to world food security" (PDF). Food and Agriculture Organization. July 2011. Retrieved 22 May 2018. ^ a b c "Quinoa". Agricultural Marketing Resource Center, US Department of Agriculture. November 2017. Retrieved 28 July 2018. ^ a b c d e Blythman, Joanna (16 January 2013). "Can vegans stomach the unpalatable truth about quinoa?". London: The Guardian. Retrieved 17 Jan 2013. ^ Fuentes, F. F.; Martínez, E. A.; Hinrischen, P. V.; Jellen, E. N.; Maughan, P. J. (10 May 2008). "Assessment of genetic diversity patterns in Chilean quinoa (Chenopodium quinoa Willd.) germplasm using multiplex fluorescent microsatellite" (PDF). Conservation Genetics. 10 (2): 369–377. doi:10.1007/s10592-008-9604-3. Retrieved 14 February 2016. ^ Kolata, Alan L. (2009). "Quinoa" (PDF). Quinoa: Production, Consumption and Social Value in Historical Context. Department of Anthropology, The University of Chicago. ^ a b c d e The Lost Crops of the Incas: Little-Known Plants of the Andes with Promise for Worldwide Cultivation. U.S. National Research Council, Advisory Committee on Technology Innovation, National Academies. 1989. ^ Reinhard Lieberei, Christoph Reissdorff & Wolfgang Franke (2007). Nutzpflanzenkunde. Georg Thieme Verlag. ISBN 978-3135304076. ^ Vaughn, JG; Geissler, CA (2009). The New Oxford Book of Food Plants. Oxford University Press. ISBN 978-0199549467. ^ Barbara Pickersgill (August 31, 2007). "Domestication of Plants in the Americas: Insights from Mendelian and Molecular Genetics". Annals of Botany. 100 (5): 925–40. doi:10.1093/aob/mcm193. PMC 2759216. PMID 17766847. Archived from the original on October 21, 2007. ^ Heiser Jr., Charles B. & Nelson, David C. (September 1974). "On the Origin of the Cultivated Chenopods (Chenopodium)". Genetics. 78 (1): 503–5. PMC 1213209. PMID 4442716. ^ a b c d e Jarvis, David E.; Ho, Yung Shwen; Lightfoot, Damien J.; Schmöckel, Sandra M.; Li, Bo; Borm, Theo J. A.; Ohyanagi, Hajime; Mineta, Katsuhiko; Michell, Craig T. (2017-02-08). "The genome of Chenopodium quinoa". Nature. advance online publication (7641): 307–312. Bibcode:2017Natur.542..307J. doi:10.1038/nature21370. ISSN 1476-4687. PMID 28178233. ^ a b "Quinoa". Alternative Field Crops Manual. University of Wisconsin Extension and University of Minnesota. January 20, 2000. ^ Masterbroek, H.D. ; Limburg, H.; Gilles, T.; Marvin, H. J. (2000). "Occurrence of sapogenins in leaves and seeds of Quinoa (Chenopodium quinoa Willd)". Journal of the Science of Food and Agriculture. 80: 152–156. doi:10.1002/(SICI)1097-0010(20000101)80:1<152::AID-JSFA503>3.0.CO;2-P.
^ "Biopesticides Registration Action Document: Saponins of Chenopodium quinoa" (PDF). EPA. 2009. ^ Siener, Roswitha; Honow, Ruth; Seidler, Ana; Voss, Susanne; Hesse, Albrecht (2006). "Oxalate contents of species of the Polygonaceae, Amaranthaceae and Chenopodiaceae families". Food Chemistry. 98 (2): 220–224. doi:10.1016/j.foodchem.2005.05.059. ^ Abugoch, James L. E. (2009). Quinoa (Chenopodium quinoa Willd. ): composition, chemistry, nutritional, and functional properties. Adv Food Nutr Res (Review). Advances in Food and Nutrition Research. 58. pp. 1–31. doi:10.1016/S1043-4526(09)58001-1. ISBN 9780123744418. PMID 19878856. ^ Greg Schlick & David L. Bubenheim (November 1993). "Quinoa: An Emerging "New" Crop with Potential for CELSS" (PDF). NASA Technical Paper 3422. NASA. ^ "European Quinoa Group". www.quinoaeurope.eu. Retrieved 2015-12-27. ^ Hinojosa, Leonardo; González, Juan; Barrios-Masias, Felipe; Fuentes, Francisco; Murphy, Kevin; Hinojosa, Leonardo; González, Juan A.; Barrios-Masias, Felipe H.; Fuentes, Francisco (November 2018). "Quinoa Abiotic Stress Responses: A Review". Plants. 7 (4): 106. doi:10.3390/plants7040106. PMC 6313892. PMID 30501077. ^ McGrath, Matt (8 February 2017). "Quinoa genome could see 'super-food' prices tumble". BBC News. Retrieved 9 February 2017. ^ a b "Quinoa production in 2016, Crops/Regions/World list/Production Quantity (pick lists)". UN Food and Agriculture Organization, Corporate Statistical Database (FAOSTAT). 2017. Retrieved 28 July 2018. ^ Collyns, Dan (14 January 2013). "Quinoa brings riches to the Andes". London: The Guardian. Retrieved 17 Jan 2013. ^ Collyns, Dan (14 January 2013). "IQuinoa brings riches to the Andes". London: The Guardian. Retrieved 17 Jan 2013. ^ Ernest Small (2013), 'Quinoa – is the United Nations' featured crop of 2013 bad for biodiversity? ', Biodiversity, 14:3, 169-179 (p. 176), DOI:10.1080/14888386.2013.835551. ^ Alastair Bland (29 November 2012). "Quinoa Craze Inspires North America To Start Growing Its Own". NPR. Retrieved 28 July 2018. ^ a b c Tom Philpott. "Quinoa: Good, Evil, or Just Really Complicated?". Mother Jones. Retrieved 2013-11-24. ^ a b Ernest Small (2013), 'Quinoa – is the United Nations' featured crop of 2013 bad for biodiversity? ', Biodiversity, 14:3, 169-179 (pp. 176-77), DOI:10.1080/14888386.2013.835551. ^ Marc F. Bellemare, Johanna Fajardo-Gonzalez and Seth R. Gitter, 'Foods and Fads: The Welfare Impacts of Rising Quinoa Prices in Peru', Towson University Department of Economics Working Paper Series Working Paper No. 2016-06 (March 2016), http://webapps.towson.edu/cbe/economics/workingpapers/2016-06.pdf. ^ Allison Aubrey (2013-06-07). "Your Love Of Quinoa Is Good News For Andean Farmers". NPR. Retrieved 2013-08-01. ^ a b c d e Cinthya Verastegui Effel, 'Implications of the Quinoa Boom on the Farmers’ Income: How do changes in the quinoa market structure mediate quinoa farmers’ income' (unpublished MA thesis, Institute of Social Studies, Erasmus University, 2012), https://thesis.eur.nl/pub/13122/. ^ a b Alexander Kasterine (17 July 2016). "Quinoa isn't a threat to food security. It's improving Peruvian farmers' lives". The Guardian. Retrieved 28 July 2018. ^ Andrew Ofstehage, 'The construction of an alternative quinoa economy: balancing solidarity, household needs, and profit in San Agustín, Bolivia', Agriculture and Human Values (2012) 29:441–454 DOI 10.1007/s10460-012-9371-0. ^ Tanya M. Kerssen (2015), 'Food sovereignty and the quinoa boom: challenges to sustainable re-peasantisation in the southern Altiplano of Bolivia', Third World Quarterly, 36:3, 489-507, DOI:10.1080/01436597.2015.100. ^ Dan Collyns (14 January 2013). "Quinoa brings riches to the Andes". The Guardian. Retrieved 5 September 2013. ^ a b Ernest Small (2013), 'Quinoa – is the United Nations' featured crop of 2013 bad for biodiversity? ', Biodiversity, 14:3, 169-179, DOI:10.1080/14888386.2013.835551. ^ S.-E. Jacobsen, 'The Situation for Quinoa and Its Production in Southern Bolivia: From Economic Success to Environmental Disaster', Journal of Agronomy and Crop Science, 197 (2011), 390-99; doi:10.1111/j.1439-037X.2011.00475.x. ^ Alibhai-Brown, Yasmin (January 8, 2018). "Sanctimonious vegans would do well to think about their diet's global impact". ^ Ernest Small (2013), 'Quinoa – is the United Nations' featured crop of 2013 bad for biodiversity? ', Biodiversity, 14:3, 169-179 (p. 177), DOI:10.1080/14888386.2013.835551. ^ United Nations (2012). Resolution adopted by the General Assembly (PDF). Archived from the original (PDF) on 2013-05-30. ^ Food and Agriculture Organization of the United Nations (2013). International Year of Quinoa. ^ "International Years". United Nations. Retrieved 9 June 2012. ^ Hopper, Tristin (March 25, 2013). "Jews divided by great Passover debate: Is quinoa kosher?". National Post. Archived from the original on April 11, 2013. Retrieved 2013-11-24. ^ Nemes, Hody (December 23, 2013). "Quinoa Ruled Kosher for Passover". Forward. Retrieved 2014-02-07. ^ Keppel, Stephen (March 4, 2012). "The Quinoa Boom Is a Lesson in the Global Economy". ABC Univision. Retrieved 16 March 2013. ^ Keen, Benjamin; Haynes, Keith (2008). A History of Latin America. Boston, MA: Houghton Mifflin Harcourt Publishing Company. p. 32. ISBN 978-0618783182. ^ a b Popenoe, Hugh (1989). Lost crops of the Incas: little-known plants of the Andes with promise for worldwide cultivation. Washington, D.C.: National Academy Press. p. 149. ISBN 978-0-309-04264-2. ^ Gade, Daniel W. (1999). Nature and culture in the Andes. Madison: University of Wisconsin Press. p. 206. ISBN 978-0-299-16124-8. ^ Bailey, Garrick Alan; Peoples, James (2009). Humanity: an introduction to cultural anthropology. Belmont, CA: Wadsworth Cengage Learning. p. 120. ISBN 978-0-495-50874-8. ^ Bernice Kagan; Meredith McCarty (1995). Fresh from a vegetarian kitchen. New York: St. Martin's Press. p. 56. ISBN 978-0-312-11795-5. ^ Andy Turnbull (2005). We need to talk: about the future of Canada. Toronto: Red Ear Pub. p. 23. ISBN 978-0-9681258-5-4. Pulvento C, Riccardi M, Lavini A, d'Andria R, Iafelice G, Marconi E (2010). "Field Trial Evaluation of Two Chenopodium quinoa Genotypes Grown Under Rain-Fed Conditions in a Typical Mediterranean Environment in South Italy". Journal of Agronomy and Crop Science. 196 (6): 407–411. doi:10.1111/j.1439-037X.2010.00431.x. Romero, Simon; Shahriari, Sara (March 19, 2011). "Quinoa's Global Success Creates Quandary at Home". The New York Times. Retrieved July 22, 2012. Geerts S, Raes D, Garcia M, Vacher J, Mamani R, Mendoza J, Huanca R, Morales B, Miranda R, Cusicanqui J, Taboada C (2008). "Introducing deficit irrigation to stabilize yields of quinoa (Chenopodium quinoa Willd.)". Eur. J. Agron. 28 (3): 427–436. doi:10.1016/j.eja.2007.11.008. Geerts S, Raes D, Garcia M, Mendoza J, Huanca R (2008). "Indicators to quantify the flexible phenology of quinoa (Chenopodium quinoa Willd.) in response to drought stress". Field Crop. Res. 108 (2): 150–6. doi:10.1016/j.fcr.2008.04.008. Geerts S, Raes D, Garcia M, Condori O, Mamani J, Miranda R, Cusicanqui J, Taboada C, Vacher J (2008). "Could deficit irrigation be a sustainable practice for quinoa (Chenopodium quinoa Willd.) in the Southern Bolivian Altiplano?". Agric. Water Manage. 95 (8): 909–917. doi:10.1016/j.agwat.2008.02.012. Geerts S, Raes D, Garcia M, Taboada C, Miranda R, Cusicanqui J, Mhizha T, Vacher J (2009). "Modeling the potential for closing quinoa yield gaps under varying water availability in the Bolivian Altiplano". Agric. Water Manage. 96 (11): 1652–1658. doi:10.1016/j.agwat.2009.06.020. This page was last edited on 18 April 2019, at 00:52 (UTC).